ESPN’s Studio Coverage is Non-Stop as College Football Playoff Semifinals and New Year’s Six Gets Underway - ESPN Press Room U.S.
ESPN’s multi-network studio coverage will hit the road for the College Football Playoff, beginning Thursday, Dec. 28 ahead of the New Year’s Six, and continuing through New Year’s Day with live shows from each of the College Football Playoff Semifinals – the Rose Bowl Game Presented by Northwestern Mutual, featuring No. 2 Oklahoma vs. No. 3 Georgia (5 p.m. ET, ESPN) and Allstate Sugar Bowl, a rematch of the last two CFP National Championship Presented by AT&T with No. 1 Clemson facing No. 4 Alabama (8:45 p.m., ESPN) on Jan. 1. Nearly 25 hosts, analysts and reporters will be live and on-site in Pasadena, Calif., and New Orleans following all the latest news and action as college football fans prepare to ring in the New Year with a slate of marquee games on ESPN. 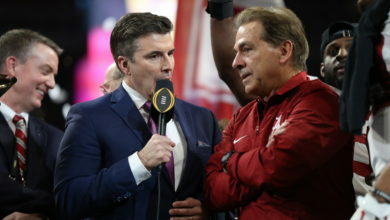 A total of eight different sets will be utilized as ESPN, ESPN2 and SEC Network provide extensive coverage of the College Football Playoff Semifinals. A special edition of College GameDay Built by The Home Depot will air from the Rose Bowl on Monday, Jan. 1, from 9 a.m. to 12:30 p.m., as part of the more than 15 hours of studio coverage over five days across multiple networks. SEC Nation Presented by AT&T will air from 10 a.m. to noon, and again at 4 p.m. on New Year’s Day. Both shows will have comprehensive coverage and previews of both CFP Semifinals which will be played later that day. Championship Drive will be live on Saturday, Dec. 30, from 9 a.m. – noon on ESPN, covering media days from Pasadena and New Orleans, while SEC Nation Presented by AT&T on SEC Network airs 10 a.m. – noon on the same day. Sugar Bowl media day will take place at the Mercedes-Benz Superdome (9-11 a.m. ET), while Rose Bowl Media Day will take place in downtown Los Angeles (11 a.m. – 1 p.m. ET). Championship Drive will also recap the Goodyear Cotton Bowl Classic and preview the upcoming PlayStation Fiesta Bowl featuring No. 9 Penn State vs. No. 11 Washington (4 p.m.) and Capital One Orange Bowl between No. 6 Wisconsin and No. 10 Miami (8 p.m.), which air later that same day on ESPN. Rose Bowl pregame show will begin at approximately 4:30 p.m.
SEC Nation Presented by AT&T will originate from New Orleans, providing expert SEC opinion and analysis from host Rutledge, analysts Tebow, Spears and Finebaum, and reporter Lauren Sisler, as well as additional pre-game insight from Greg McElroy and Gene Chizik. Along with the set inside the Mercedes-Benz Superdome, SEC Network will have a live set in Pasadena at the College Football Playoff Semifinal at the Rose Bowl with host Dari Nowkhah and analysts Chris Doering and Matt Stinchcomb. Additional details of SEC Network’s coverage can be found here.